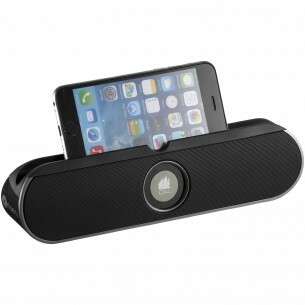 If you want to listen to music wherever you want, the branded Jodie Bar Bluetooth Speaker Stand is a simple solution. The speaker connects to any Bluetooth device up to 10 metres away, and it also includes a built-in smartphone stand to provide an all-in-one device. This also makes it a great option for watching a film on your phone or tablet. A Micro USB to USB cable comes included, and it is presented in a gift box.